Due to blatantly false appraisals that caused the collapse of the savings and loan industry in 1988, it became mandatory for real estate appraisers to provide transparent, verifiable and unbiased appraisals of real estate. All major banks now request USPAP complaint appraisals for all assets, including marine equipment. The basic premise behind USPAP is that any appraisal report should be transparent as far as the process used for reaching a value, and that third-party readers of the report can understand the methodology used to reach a value opinion. Professional appraisers in specialized fields, such as marine asset valuation, often also carry certifications from organizations, such as the American Society of Appraisers (ASA), which requires many years of training and experience. An accredited appraiser is committed to providing unbiased value opinions derived via a thorough, documented process. The appraiser will consider and use (or dismiss with cause) the three basic paths to value: the cost approach, the comparable sales approach, and the income approach. Most people are familiar with the comparable sales or market approach as applied in the residential real estate industry. In the marine industry, this approach involves the identification of vessels that are similar to the subject vessel in terms of function, age, size and other properties. The appraiser then accounts for variations in the chosen properties to produce a rational, easily understood value opinion. Even more so than the real estate industry, the maritime field abounds with countless properties that have a staggering array of features, ages and end-use applications. Also unlike the real estate industry, there is no readily available database of consummated marine vessel transactions – nor any incentive for buyers and sellers to divulge their sales price. So what happens when there are no viable sales numbers available? This situation is common in marine appraisal. For example, through the OSV building boom of 2000 to 2008, there were no sales, as no one wanted to sell moneymaking vessels. From 2012 to the present, there are no sales as there are more boats than work and no one wants to buy another idle asset. In the former period, when business was strong, appraisers could make the case for using the income approach, or discounted cash flow model. In this approach, the future cash flows of the vessel are evaluated against the risk of obtaining those cash flows, and a “net present value” is calculated. However, banks in this period were often wary, so risk models were challenging to construct. Lenders know how cyclical marine markets can be and it might be difficult to convince a banker that your 240’ PSV with 25 years of remaining life is going to continue to make that a deliriously high 2007 day-rate for the rest of its economic life. While it is hard enough to estimate a vessel’s expenses into the future, estimating even a gross income stream takes the appraiser and banker into a minefield of assumptions. Under these conditions, where the market and income approaches are not highly reliable, the appraiser following USPAP looks to the cost, or “depreciated replacement cost,” approach. The experienced appraiser will determine a vessel’s replacement cost – the cost to build a similar vessel new today - and depreciate it over the expected normal useful life of the vessel. This is its designed life, which can vary by vessel type and service from approximately twenty to thirty-five years. At the end of the vessel’s normal economic life, there is usually some residual value. Be it a secondary use, salvage value, or scrap value, most vessels do not depreciate 100 percent. To avoid confusion with leasing terminology, we often refer to this residual value as a “terminal value.” Having calculated an annual depreciation rate, the appraiser then looks at a vessel’s remaining useful life, which gives a gross value, having only measured age, i.e., physical condition. The appraiser must then also look at “technical obsolescence.” For example, does the vessel have Tier 2 engines and no dynamic positioning when the competing boats in the market are Tier 3 and have some level of DP certification? If so, the asset’s value may be significantly degraded in the marketplace. Finally, there is “economic depreciation” or “economic obsolescence.” This is a loss of value or usefulness of a property caused by factors external to the property. In today’s OSV market, the industry is awash in near new boats with state-of-the-art outfitting that may never find a buyer through no fault of the asset itself. In this case, economic circumstances in the market place can significantly affect the final appraised value. These forms of depreciation - physical, technological and economic - can be “curable” or “incurable.” That is, does it make financial sense to do life extension work to remove physical depreciation? If so, it’s curable. Does it make financial sense to repower or add a DP system to remove technological obsolescence? If not, it is incurable depreciation. Economic depreciation, often measured by the fall in day rates, may not be curable solely by a vessel owner as industry factors, like raw material demand, changing trade routes,or IMO or U.S. Coast Guard regulations, are beyond an individual owner’s control. 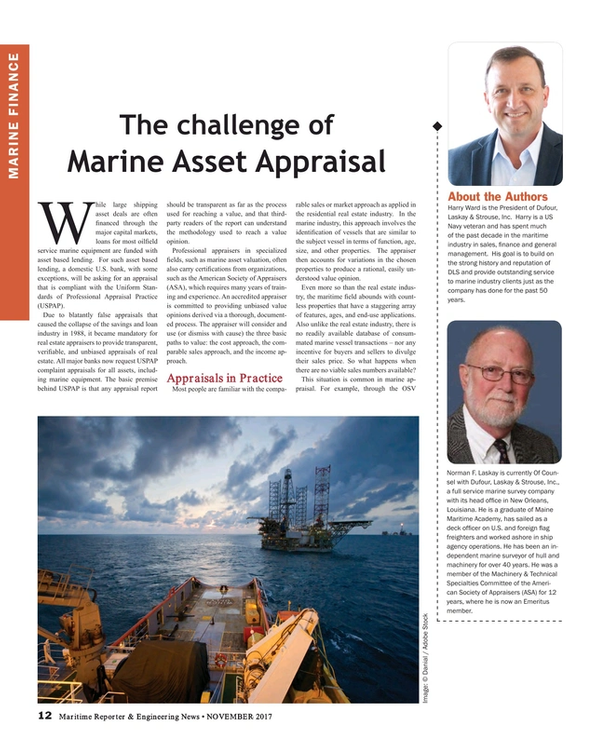 Maritime asset appraisal is a challenging process that involves a delicate balance of art and science. Unlike in residential home valuation, a professional marine appraiser starts with no database of comparable sales, and he or she must have a deep understanding of the unique combination of terminology and market forces that comprise the marine market. On top of all this, the maritime industry is a global and highly regulated set of markets. An OSV in the North Sea is likely to be operated – and appraised – quite differently than a similar vessel in the Gulf of Mexico. Certified marine asset appraisers following USPAP requirements play a challenging but exciting role in the maritime industry. Harry Ward is the President of Dufour, Laskay & Strouse, Inc. Harry is a U.S. Navy veteran and has spent much of the past decade in the maritime industry in sales, finance and general management. His goal is to build on the strong history and reputation of DLS and provide outstanding service to marine industry clients just as the company has done for the past 50 years. Norman F. Laskay is currently Of Counsel with Dufour, Laskay & Strouse, Inc., a full service marine survey company with its head office in New Orleans, Louisiana. He is a graduate of Maine Maritime Academy, has sailed as a deck officer on U.S. and foreign flag freighters and worked ashore in ship agency operations. He has been an independent marine surveyor of hull and machinery for over 40 years. He was a member of the Machinery & Technical Specialties Committee of the American Society of Appraisers (ASA) for 12 years, where he is now an Emeritus member.